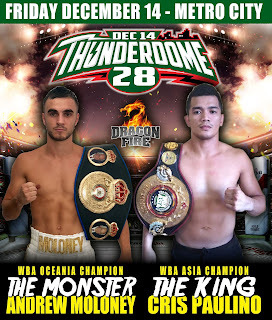 Press Release: November 17, 2018 by Dragon Fire Boxing – WBA #4, WBC #4 , WBO #9 IBF #11, Undefeated Andrew “The Monster” Moloney (18 – 0) returns to the ring for his final outing of 2018. Moloney is also rated #6 by Ring Magazine, the highest rated Australian along with brother Jason #7 and Jeff Horn at #9. 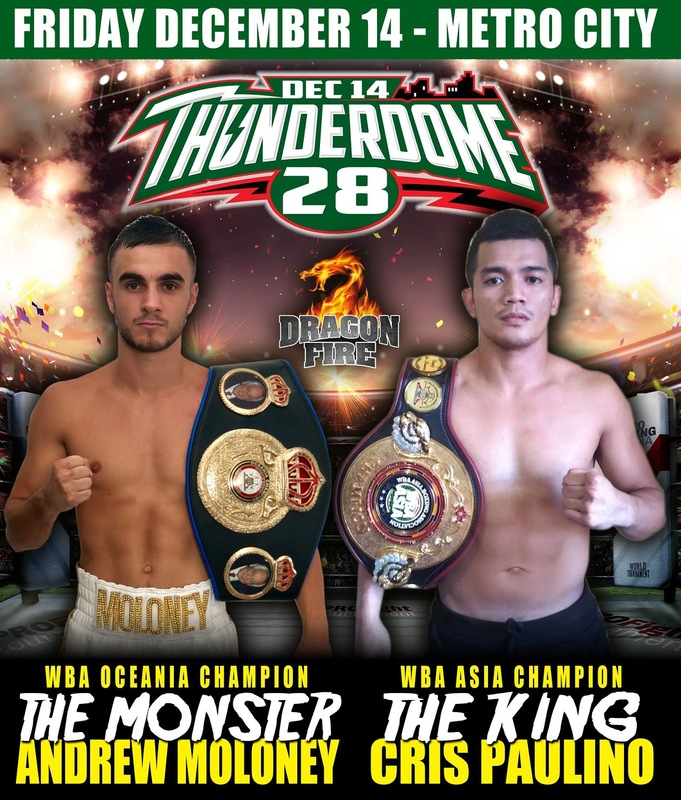 Moloney the WBA Oceania, Commonwealth & OPBF Super Flyweight Champion takes on WBA Asian Super Flyweight Champion Cris “The King Paulino (19-3). The bout will be the headline bout of Dragon Fire Boxing’s “Thunderdome 28 Event in Perth Western Australia. The fighting pride of Manilla, Paulino is riding high on a 5 fight win streak and is no stranger to fighting in Australia previous taking on future hall of famer “The Ragin Bull” Vic Darchinyan in his last defeat. Paulino also fought current WBA #8 and former WBA World Champion Koki Eto in Japan over 10 grueling rounds. “My preparation has been great for this fight so far. I didn’t have any time off after my last fight as I was straight back in the gym to help my brother prepare for his World Title fight. I got some good sparring while we were over in Orlando for Jason’s fight and I am feeling great. I’m excited to be fighting in Perth and I can’t wait to fight on Thunderdome at Metro City. I have never been to the venue before but I have watched the fights from there on TV and the atmosphere looks great! I’m really looking forward to it. I have fought in Perth a few times as an amateur. The last time I fought in Perth I had a great win over the WBC #1 bantamweight contender Duke Micah from Ghana. We have studied my opponent Cris Paulino and we expect a very tough fight from him. It will be good experience for me fighting against a southpaw as this is only the second southpaw I have faced in my professional career. I’m excited to be fighting against a fellow WBA champion. My team has made offers to all the WBA rated fighters, including the current World Champion Kal Yafai. I really hope I get the opportunity to fight Yafai next for the World Title. It’s disappointing to see that he is fighting a guy rated at #14 in his next fight.